Continuing our series on where to find the information you need for your visit to Maine, let’s talk lobster – or let’s talk lobstah. However you pronounce it, it is uniquiely associated with Maine and uncommonly tasty. Quite some time ago we talked about where to go for Maine lobster, providing a discussion of seasons, hard and soft shells, etc. – that information is a good starting point. Most places offer lobster, whether restaurants, diners, hole-in-the-wall cafes, fast food places, lobster roll places, or lobster shacks. Usually it is a lobster dinner, with ears of sweet corn and a side of coleslaw. Practically any restaurant in the state will offer lobster. Some are the traditional lobster dinner, others are more exotic creations from the chef. All use the delicious local red crustacean. Many folks like the idea of lobster fresh off the boats. You can find that at most of Maine’s lobster shacks along the coast. 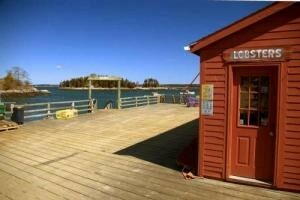 In some cases the prices are better at the lobster shacks, too. Travel + Leisure Magazine has an article (updated in June, 2009) on “The 10 Best Lobster Shacks in Maine” which gives some good recommendations. It includes Red’s Eats in Wiscasset, which we’ll class under Lobster Roll, below, but most of the others are genuine lobster shacks. Some of our favorites are Harasseeket Lunch and Lobster, in South Freeport, and Five Islands Lobster Company in Five Islands. Five Islands offers a spectacular view of the five islands directly off shore, and you can watch the lobster boats come and go from the dock. Not mentioned in the article, but certainly among our favorites, are the Lobster Shack at Two Lights, in Cape Elizabeth, where you climb up to a lobster shack perched atop a great bluff, and overlook Casco Bay and the Cape Elizabeth (Two Lights) lighthouses. The view alone is worth a visit. Another favorite is the Lobster Dock in Boothbay Harbor, where you can eat inside or out, overlooking the boat traffic in the harbor, and just a short walk across the footbridge to the village. An entirely different category (at least that’s our story, and we’re sticking to it) is the lobster roll. Found at many different kinds of eatery (including McDonalds in Freeport! ), the lobster roll is an art form of its own. Generally the roll is a small hot dog bun, laid open, with chunks of lobster piled on it. Some mix the lobster with a sauce, others serve the sauce on the side. Most agree that the less sauce, the better. Consistently popular enough to cause traffic jams all summer long is Red’s Eats, right on US-1 in Wiscasset. About a pound of lobster chunks on a bun, with sauce on the side, the line winds down the street even on a cold, rainy, spring day. Expect to wait, but don’t be tempted to go elsewhere. You’ve been warned! A similar experience can be had at the Clam Shack in Kennebunkport, where the lobster rolls are considered among the best in the state. Once again, many types of eatery provide wonderful lobster stews. Creamy and filled with lobster chunks, the best ones are a meal in a bowl. Our favorite in this department is the Sea Basket, in Wiscasset. You can even buy the stock (frozen) to take home. Just add cream and heat! 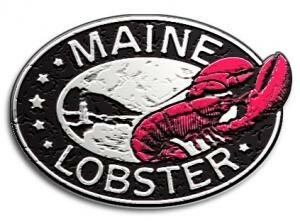 Check the Maine Lobster Promotion Council for more information about Maine Lobster!